Sunset backyard – Summer has begun! Gavin and Saige getting ready for Harpers Princess Party for her 4th Birthday. New outfit from Aunt Joke and Uncle Sjaak! 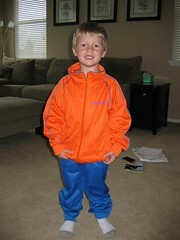 Look at my new outfit I received from Aunt Joke, Uncle Sjaak and Elles, Anniek and Myrthe. Now I finally can work out with mom and dad. Thanks Guys for this nice trainings pak, it will fit me next year too!